Hi all, new to the sport after a few experience days and starting lessons soon. I'm in no rush to buy my first gun, but I am naturally narrowing down my options. Is anyone aware of any shooting grounds that have a decent range of demo / training guns to try? Or decent gun shops attached to a shooting ground? I'm based in the South-East, but distance is not a problem. Also, I'll take any recommendations on any game fairs / shows coming up in 2019 that are well represented by the major manufacturers? Just be good to try out a few alongside each other as I'm not sure as a novice I'd be able to tell what I like and don't like about a gun unless there's a direct comparison available. EJ Churchill, Oxford Gun co, William Evans at Bisley, Southdown are all gun shops at grounds. Do any of those have a better reputation than the others or are they all pretty similar? Chris Potter Guns at Tunbridge Wells used to have an arrangement with West Kent Shooting School a few miles away to try guns, might be worthwhile checking if they still do. Further away there's Ian Coley's gun shop on his ground, that's just outside Cheltenham. A bit further still is Premier Guns at Doveridge shooting ground in Derbyshire. Different I would say.. controversial to pick one. Oxford gun co may have best selection of “first gun” but I’m not convinced they are the best at getting the customer what they NEED. I would visit several places if you’re not sure what you want. Potters certainly don't tie you down to using a particular ground if using a demo gun. They let me take one Friday to Monday so i could test it out properly. IMO Potters is one of, if not, the best shops in the south east. The professionalism of Jake and Dionne in the gun room is second to none. Lots of good places, (like Park Street guns) but if you don’t have your certificate yet it needs to be a shooting ground. You're biased. When's the Salvinelli arrive? Looking forward to seeing some photos posted when it arrives! What a lovely figured stock. That's going to look amazing when all oiled up! He didn't post the photo of him holding it. Probably because he is sporting the biggest sh*t-eating grin I've ever seen. Watch out for the open days at Coleys. These are quite simply superb. All the major players are there and of course their own stock. Try as many as you want. Used it a couple of times when looking for semi auto and then later for something a little more high end. Recommended. They usually have two a year . April and September??? I know you are a big guy but that stock in the pic looks really long. Is it or is it just the photo making it look long? 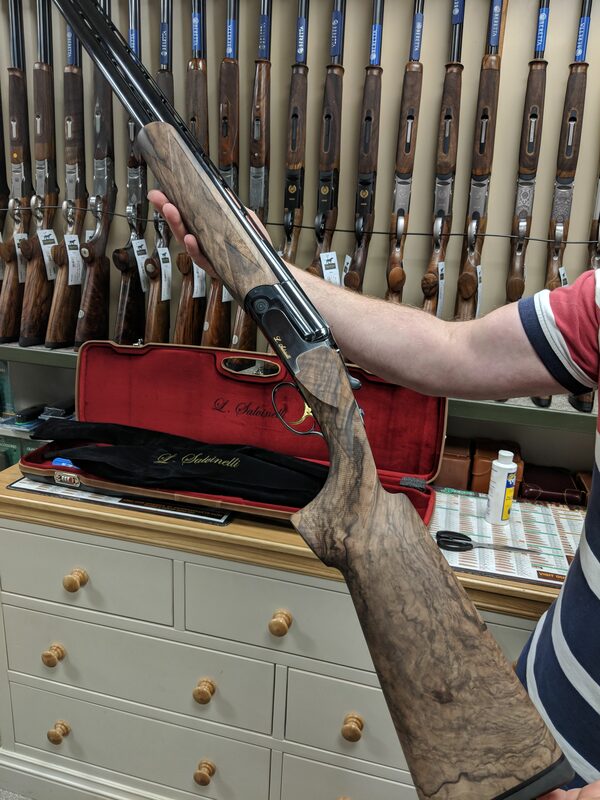 When I went for my fitting session at EJ Churchill I went with the preconceived notion that my gun was far too straight and I needed lots of cast because I saw up the side of the gun all the time. Chris knew straight away and started lengthening the LOP. It immediately brought the rib in line with my eye more. So in the end the LOP was far more than I expected, and although cast was added, not as much as I thought it would be. I also had an issue with the toe of most guns not being comfortable or fitting me at all. That's been altered here with a quarter of an inch off the toe. It feels superb. The boys at Churchillls know their onions when it comes to fitting.